Healthy and versatile Chipotle Tahini Bowls that come together under a generous drizzle of addictingly creamy vegan chipotle tahini sauce. Cook / prepare your bowl ingredients. 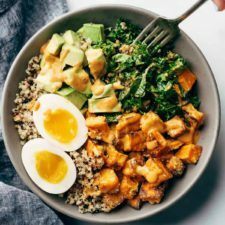 My favorite combination is kale, roasted sweet potato, avocado, quinoa, and soft boiled egg. But I've also included chicken, roasted broccoli, etc.